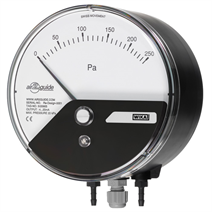 The model A2G-15 differential pressure gauge with electrical output signal is used for monitoring the differential pressure in ventilation and air-conditioning applications. The measuring ranges cover from 0 … 50 Pa to 0 … 12,500 Pa. Plus/minus ranges can be fulfilled from -25 … +25 Pa to -1,500 … +1,500 Pa.
Electrical output signals for both measurands (DC 0 ... 10 V or 4 ... 20 mA) enable the direct connection to control systems or the building automation system. The separated construction of the pressure measurement chamber and display area ensures that impurities from the process air do not settle on the back of the window. As a result of the 2-part construction (measuring element and mounting ring), the A2G-15 can be exceptionally easily and quickly mounted. The A2G-15 is available in two mounting variants. The built-in variant is notable for a fast and tool-free mounting. 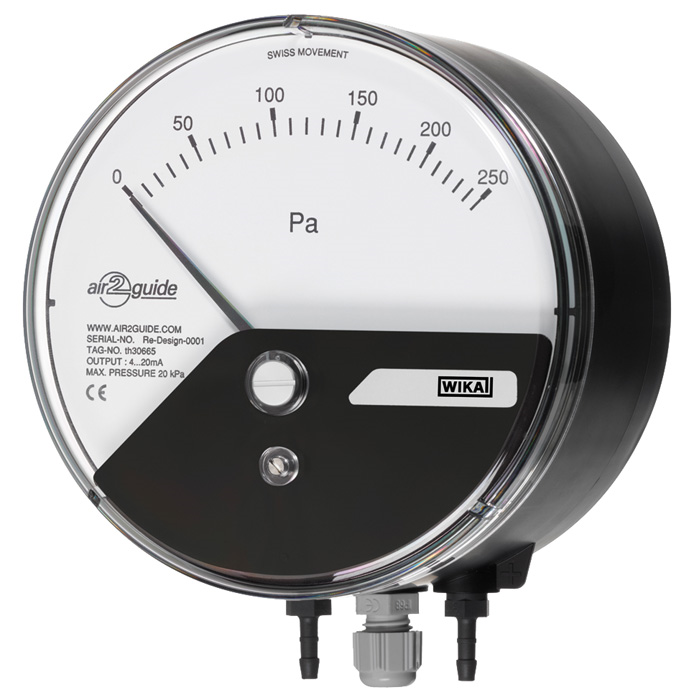 The differential pressure gauge features two G 1/8"-IG connections on the back, into which matching threaded pressure connections are screwed. In a special version, the A2G-15 is available as a silicone-free product.